Bold seafarers swept out of Scandinavia a millennium ago and terrorized and explored Europe, western Asia, and eastern Canada. 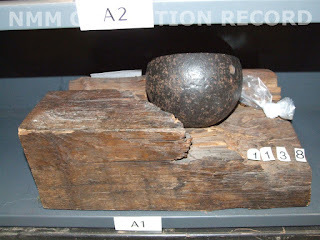 They left us amazing artifacts. In the Precopernican age everyone in Europe knew that the North Atlantic led only to a turmoil of monsters at the end of the world. Only the crazy could cross this barrier. The Vikings. 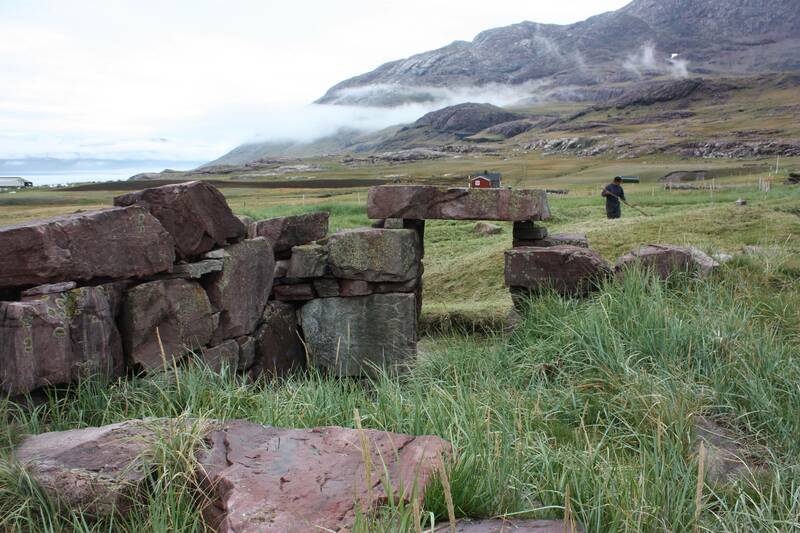 They colonized Iceland and Greenland (remains of their settlement on the left). At the end of first millenium ad the Greenland caprtain Bjarni Herjulfsson caosted a land with "well-wodden and with low hills" - America. Four times the Viking fleet sailed the Black See and raided Constantinople (they called it Miklagard, the big city). They carved their runes in famous Hagia Sophia. Impressed, the Byzantine emperors recruited warriors as a part of their guard - Varagian Guard. They served Byzantium for 200 years. There is a suggestion that the Vikings were the dominant class of eastern countries. Some historians think that the first polish king - Mieszko was a viking. We know for sure that Norsemen assimilated into local population and then, they became Slavic. 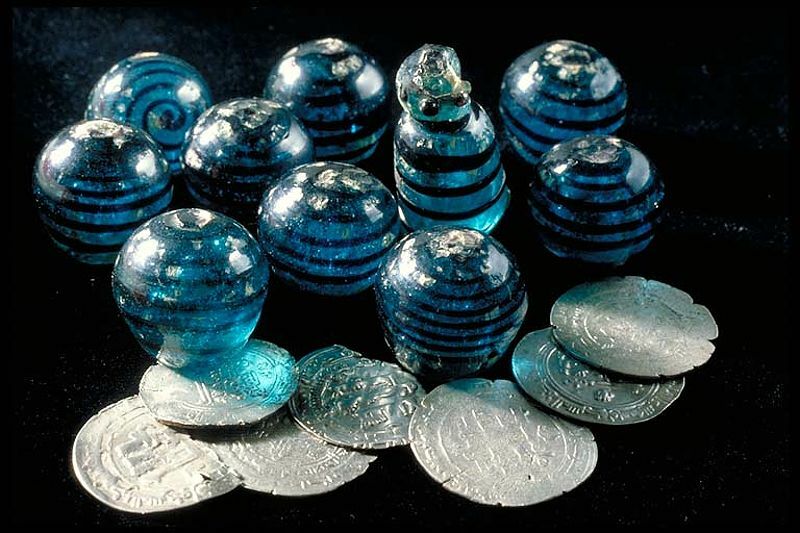 The Volga river was a rich trade road. And for the Norsemen it was also a source a trading exchange. 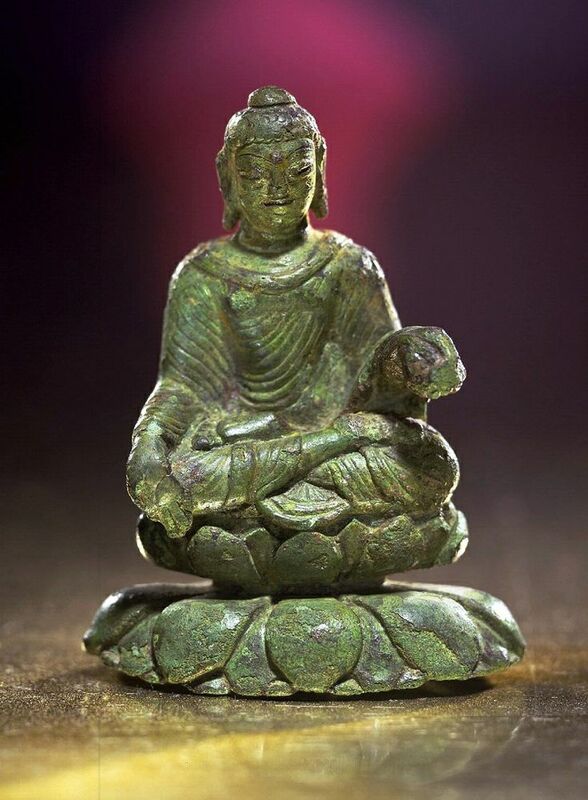 The small buddha figure was found in Viking's grave at Helgo, Sweden with some Coptic (Egyptian) landle and irish cozier. In 859 two chieftains Bjorn and Hasteinn with 62 ship made an amazing voyage. Following the bay of Biscay (France), they looted the Iberian coast, paused near the rock of Gibraltar (and plundered Moroccan city of Algerciras). Then, first time in history they sailed Mediterranean following North Africa coast. They captured their first ever dark-skinned slaves (they called them blue-men). Left: 9th century Swedish engraved silver ring shows evidence of close contacts between Viking Age Scandinavians and the Islamic world. 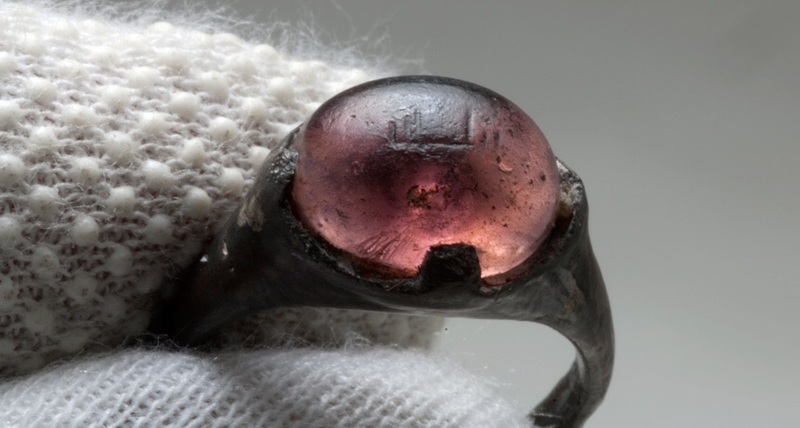 The ring is set with a piece of imported coloured glass that is inscribed with Arabic writing that reads "For/To Allah"
Inching the north Atlantic Norse settlers reached Greenland around the end of 10th century. The first Viking that landed in North America was Leif the Lucky. He came to a mass of mountains and glaciers which he named Vinland. Further south he came to a flat land with a lot of trees and grassland. Leif built a house and wintered there. We do not know for sure where did he landed but it is probably Labrador. Another Viking explored the new continent even further. His party came upon "three sin boats and three men under each". He probably met Eskimos or Indians. The Norse planned to colonize new lands. Early in 11th century Thorfinn prepared three ships loaded with 65 people and sailed to the west. His colony stood for two years. In the meantime his wife gave birth to a boy called Snorri - he was the first white child born in the America. 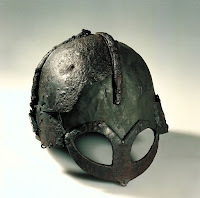 With all these battle that they fought there is only one Viking helmet that survived - from Gjermundbu mound burial. This helmet was made of iron and was in the shape of a rounded or peaked cap made from four plates after the spangenhelm pattern. The helmet has a rounded cap and has a "spectacle" guard around the eyes and nose which formed a sort of mask. So no horns. When not fighting or travelling they set aside time for fests and games. Board games and dice games were played as a popular pastime, at all levels of society. Preserved gaming pieces and boards show game boards made of easily available materials like wood, with game pieces manufactured from stone, wood or bone, while other finds include elaborately carved boards and game pieces of glass, amber, antler or walrus tusk, together with materials of foreign origin, such as ivory. The Vikings played several types of tafl games; hnefatafl, nitavl (Nine Men's Morris) and the less common kvatrutafl. Chess also appeared at the end of the Viking Age. Hnefatafl is a war game, in which the object is to capture the king piece – a large hostile army threatens and the king's men have to protect the king. It was played on a board with squares using black and white pieces, with moves made according to dice rolls. The Ockelbo Runestone shows two men engaged in Hnefatafl, and the sagas suggest that money or valuables could have been involved in some dice games. Left: Glass board game pieces. During the Viking Age, Scandinavian men and women travelled to many parts of Europe and beyond, in a cultural diaspora that left its traces from Newfoundland to Byzantium. This period of energetic activity also had a pronounced effect in the Scandinavian homelands, which were subject to a variety of new influences. In the 300 years from the late 8th century, when contemporary chroniclers first commented on the appearance of Viking raiders, to the end of the 11th century, Scandinavia underwent profound cultural changes. By the late 11th century, royal dynasties legitimised by the Catholic Church (which had had little influence in Scandinavia 300 years earlier) were asserting their power with increasing authority and ambition, and the three kingdoms of Denmark, Norway, and Sweden had taken shape. Towns appeared that functioned as secular and ecclesiastical administrative centres and market sites, and monetary economies began to emerge based on English and German models. That was the end of Viking era. 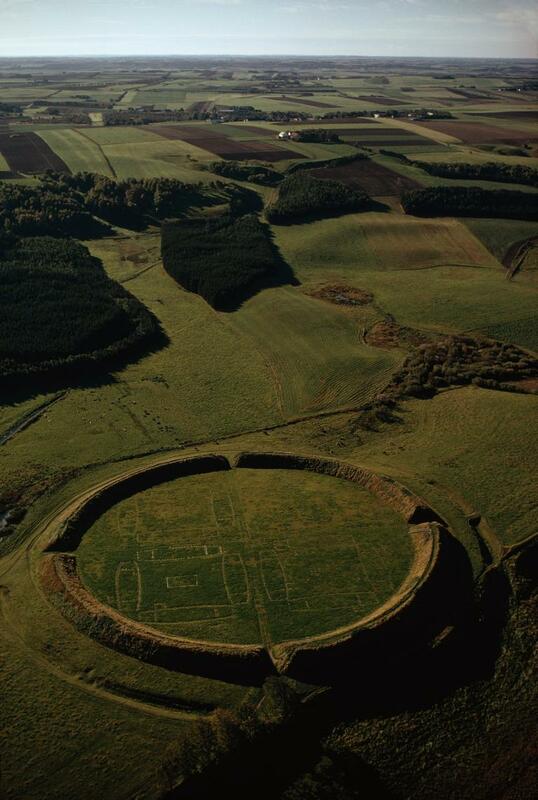 When the Viking ring (also known as Trelleborg) fortresses were discovered in Denmark, researchers were surprised: to a great extent, it came to light that they had previously underestimated both the Vikings’ organizational and technical capabilities of building military installations that would keep their enemies at a distance. Eight of them have been dated to around 980 CE – the reign of King Gorm the Old’s son, King Harald I Bluetooth of Denmark (from who the Bluetooth technology has it's name). -Borgeby north of Lund at Lödde Å in Skåne, modern Sweden. The fortresses are characterized by a ring rampart with an appurtenant moat and four covering gate openings. They had a rigorous geometric street system, a division of the internal surface area into four square-shaped blocks. 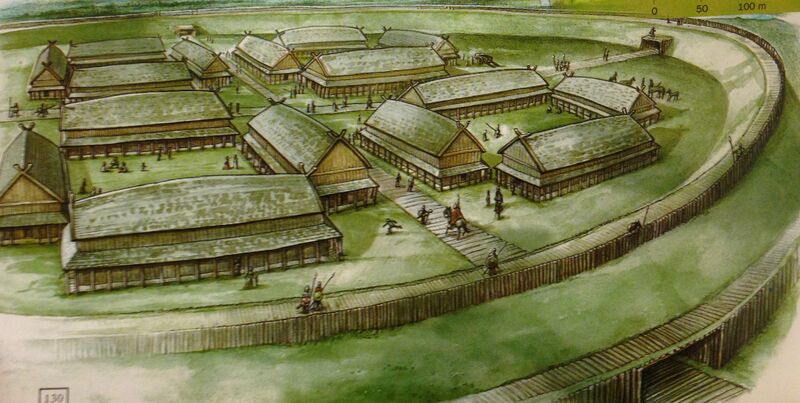 Within each of these blocks, there were four longhouses positioned in the form of farmhouses constructed around a quadrangle. All of the four facilities have a uniform and rigorous geometric architecture and a stringent symmetry, which clearly manifests itself in the fortifications’ circular forms and the gate openings’ placement with respect to the four corners of the world. Some historians think that the geometric design of the Trellenborgs was inspired by old Roman army camps. It has been estimated that the Trelleborg fortresses were built sometime around the year 980 A.D. However, it seems plausible to assume that the fortresses might not have been in existence for very long. And maybe they were operative for only a few years. We are quite sure, for example, that Fyrkat was wiped out after a raging conflagration and that it was not rebuilt. Notwithstanding their homogeneity, each one of the fortresses has its own individual constructional features. The diameter of Aggersborg, for example, is 240 meters, which is roughly twice that of the other fortresses. 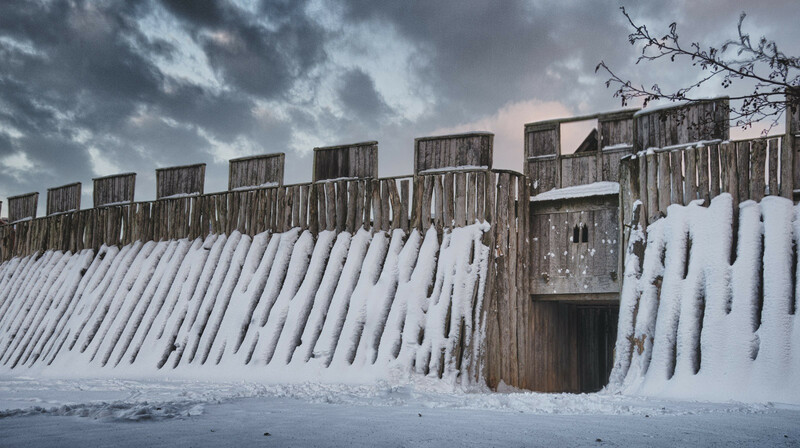 At Trelleborg, there is a bailey consisting of 15 longhouses and protected by an outer rampart of its own, as well a trench. 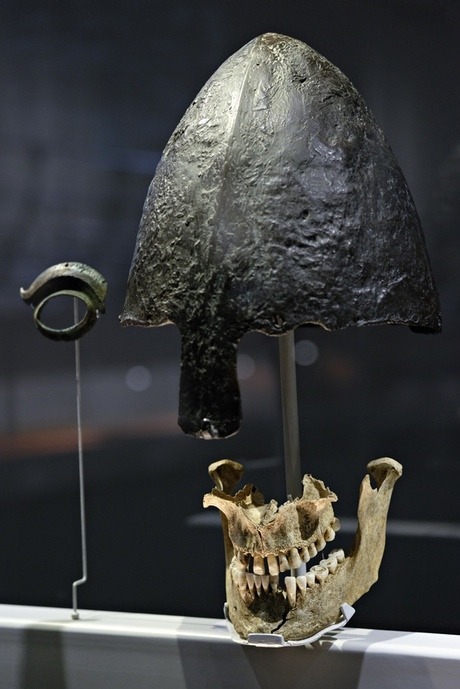 Cemeteries with remains of the Viking Era have been found at Fyrkat and Trelleborg. When one arrived as a visitor to the fortresses, they must have appeared overwhelmingly impressive on account of their earthworks, their thick wooden palisades and their high moats and they probably seemed virtually impossible to conquer. One moved through the gateway of the fortress and the ring ramparts, from where the guards stood and kept watch on whomever was arriving and suddenly found him/herself standing in the midst of the fortress’s layout, which was teeming with life. Taking the standards of the past into consideration, the houses, measuring more than 7 meters in width and almost 30 meters in length, with their outwardly bulging long walls, must have made their effect on the viewer as large halls of some sort. When we also take into account that at Trelleborg and Fyrkat, there were four square-shaped blocks arranged around quadrangles while at Aggersborg, there were sixteen such square-shaped blocks with longhouses, it is easy to envision and sense the power that lay behind the construction of these fortresses. The longhouses themselves were divided into three rooms, of which the middle room measured about 20 meters in length and was, in a number of instances, fitted with a langild (a long Iron Age/Viking fireplace, as opposed to a round or square one). Here the Vikings’ troops were quartered. It was here that they slept, repaired their personal equipment and played games that involved tossing dice. From several of the halls, shouting, singing and laughter could be heard. But not all the houses were used as residences. From the blacksmith’s workshop, the hammer’s clanking against the anvil mingled with the joyful shouts and inside the storehouse buildings, the arithmetician might have quietly and calmly been busy checking on the army’s supplies – the rations would have to last for the whole winter. The short life and rapid abandonment of these fortress shows that political change at the end of the 10th century must have made them unnecessary. Swiss knife. Victorinox was't first - the Romans were. Nowadays the Leatherman or Victorinox are the first thaughts when we think of the multi-tool or swiss knife. But history of hand tools that combines several individual functions in a single unit are much older. 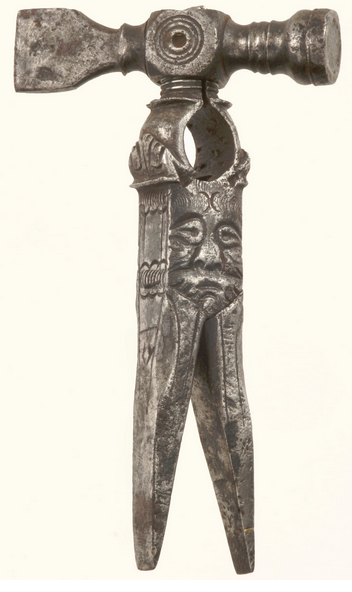 The oldest known multi-tool was made circa 1900 years ago. 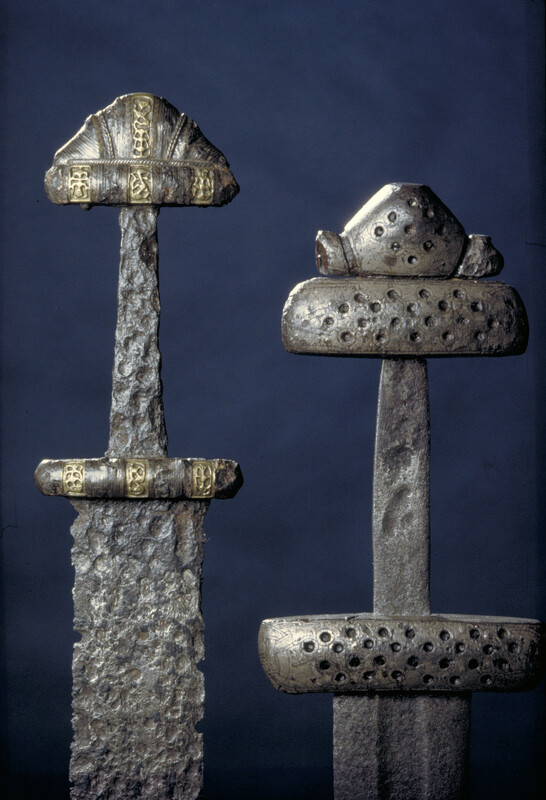 An intricately designed Roman implement, which dates back to 200AD, it is made from silver but has an iron blade. It features a spoon, fork as well as a retractable spike, spatula and small tooth-pick. 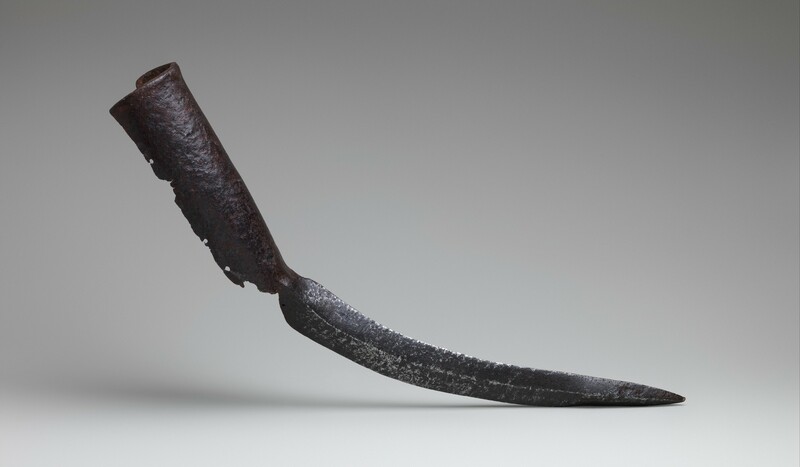 The 3in x 6in (8cm x 15cm) knife was excavated from the Mediterranean area more than 20 years ago. The first ever example of miniaturization was found in Alps, a neolithic (3000 BC!) pocket knife with hole for carrying it on a string. It probably belonged to a traveler similar to Otzi, the Iceman. It wasn’t until the end of middle ages when the idea of multi-tool came back to life. 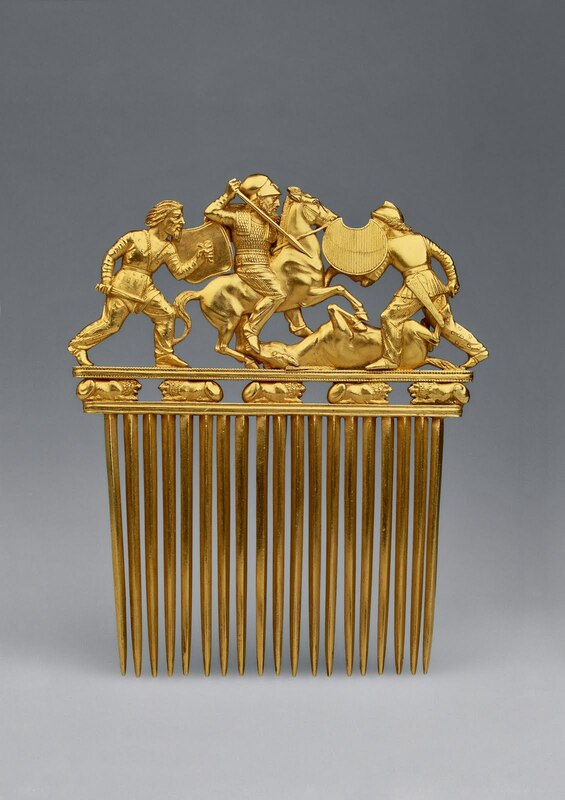 In 15th century German craftsmen made combination tools of dividers, grips, hammer, and chisel. 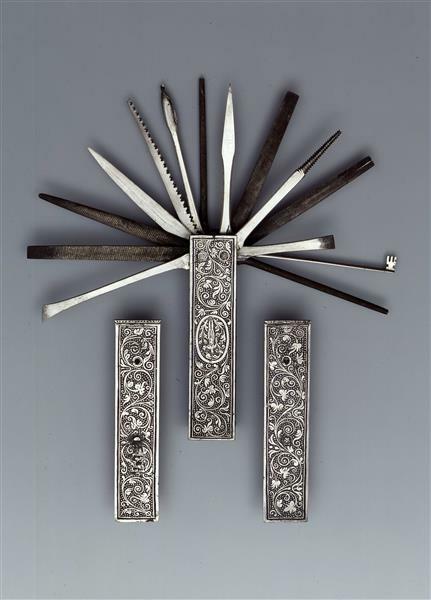 The multi-tool (left) was made in Nuremberg, contains fourteen anchored small tools, on the one hand, three rasps, a pointed Winder, a jig saw, a knife and a detour, on the other a key, four files, a square spade and a gimlet. This kind of knifes were very expensive and produced in limited amounts. 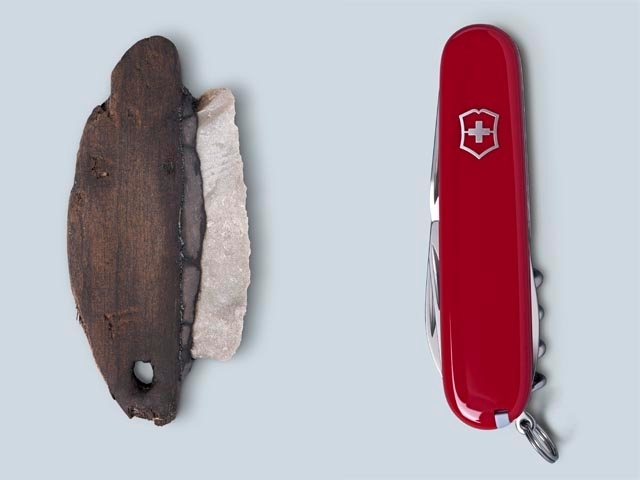 But during the late 1880s, the Swiss Army decided to purchase a new folding pocket knife for their soldiers. This knife was to be suitable for use by the army in opening canned food and disassembling the Swiss service rifle, the Schmidt–Rubin, which required a screwdriver for assembly. In January 1891, the knife received the official designation Modell 1890. The knife had a blade, reamer, can-opener, screwdriver, and grips made out of dark oak wood that was later partly replaced with ebony wood. At that time no Swiss company had the necessary production capacity, so the initial order for 15,000 knives was placed with the German knife manufacturer Wester & Co. from Solingen, Germany. These knives were delivered in October 1891. In 1891, Karl Elsener, then owner of a company that made surgical equipment, set out to manufacture the knives in Switzerland itself. That was the start of famous swiss knife. Now, you can find it in almost every house. 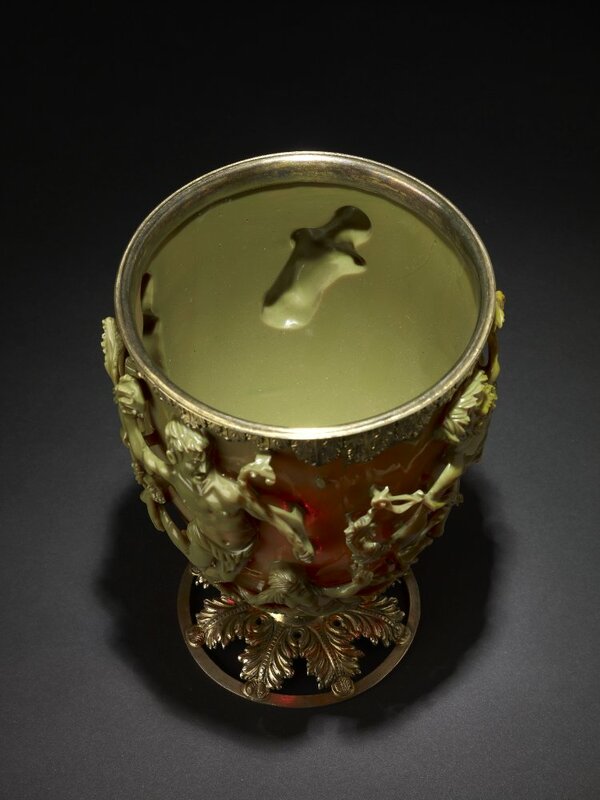 The Lycurgus Cup, as it is known due to its depiction of a scene involving King Lycurgus of Thrace, is a 1,600-year-old jade green Roman chalice. Like many others. But when you put a source of the light inside it it magically changes colour. It appears jade green when lit from the front but blood-red when lit from behind or inside. It baffled scientists ever since the glass chalice was acquired by the British Museum in the 1950s. Then in the 1990s they discovered tiny particles of silver and gold in the cup's glass. When hit with light, electrons belonging to the metal flecks vibrate in ways that alter the color depending on the observer’s position. But how did the romans dissolve silver and gold into the glass? The artisanship this required boggles the mind. The glass makers could not have added such minute amounts of gold and silver just to the glass the cup was going to made out of. These particles are 50 nanometers wide, less than one-thousandth the size of a grain of table salt.. You can’t even see them with an optical microscope, never mind the human eyeball; you need a transmission electron microscope at least. New research has suggested that the cup also changes colors when liquid is poured into it (although the researchers did not do so as it might have caused damage). The cup may have been used in Bacchic rituals which were still in practice in fourth century Rome. In addition to the story the cup tells, the color shift from green to red parallels the maturation of the grape. Historians have also posited that it might be a political reference to Constantine’s defeat of Licinius in 324 A.D. It was certainly a specific commission and a hugely expensive one at that, with everything from glass color to theme to decoration being top of the line and one of a kind. 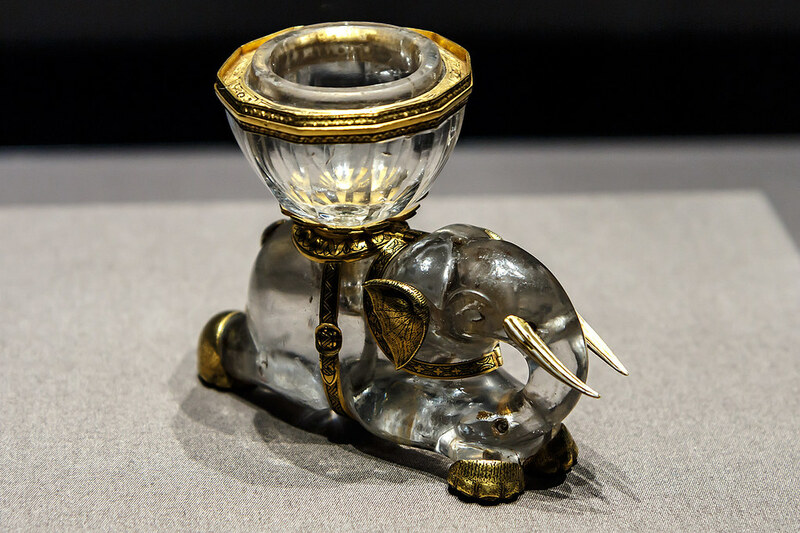 The cup is also a very rare example of a complete Roman cage-cup, or diatretum, where the glass has been painstakingly cut and ground back to leave only a decorative "cage" at the original surface-level. Many parts of the cage have been completely undercut. The cup was made probably in Alexandria or Rome in about 290-325 AD, and measures 16.5 x 13.2 cm. Yes they did. And they were really cruel. 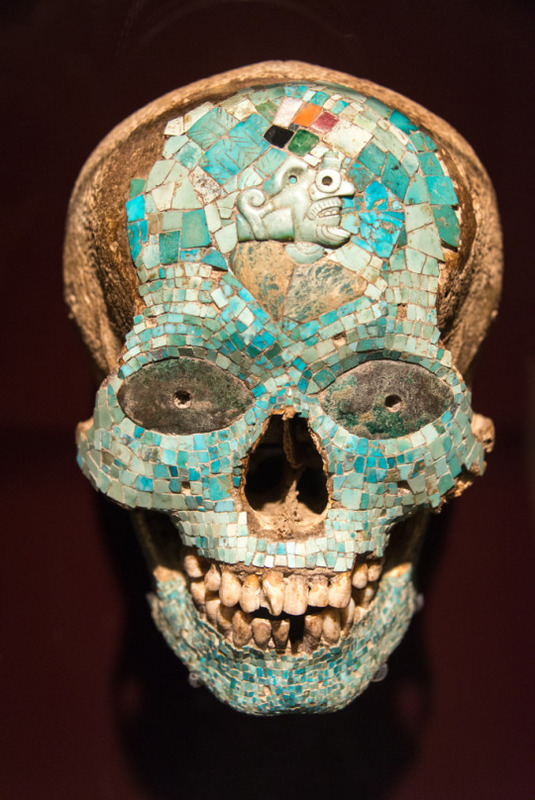 The Aztec civilization which flourished in Mesoamerica between 1345 and 1521 CE has gained an infamous reputation for bloodthirsty human sacrifice with lurid tales of the beating heart being ripped from the still-conscious victim, decapitation, skinning and dismemberment. All of these things did happen but it is important to remember that for the Aztecs the act of sacrifice - of which human sacrifice was only a part - was a strictly ritualised process which gave the highest possible honour to the gods and was regarded as a necessity to ensure mankind’s continued prosperity. The Aztec gods and goddesses also required the living hearts of humans for nourishment. All hearts were good, but the bravest captives were considered to be particularly nourishing to the Aztec gods. Their chief god was Huitzilpochtli (the Hummingbird Wizard) who represented the sun, the warrior, and fought the Aztecs' battles with the other gods to ensure the Aztecs' survival. Huitzilpochtli needed food to nourish him so he could continue to fight. His preferred food was human blood. In order to keep feeding Huitzilpochtli, the Aztecs warred continuously. Their army was of the utmost importance, and they had several different factions of warriors. The Knights of the Eagle and the Knights of the Jaguar were two such bodies of troops. These were the men who went forth to capture suitable human sacrifices. Another source of sacrificial victims was the ritual ball-games where the losing captain or even the entire team paid the ultimate price for defeat. Children too could be sacrificed, in particular, to honour the rain god Tlaloc in ceremonies held on sacred mountains. It was believed that the very tears of the child victims would propitiate rain. Slaves were another social group from which sacrificial victims were chosen, they could accompany their ruler in death or be given in offering by tradesmen to ensure prosperity in business. The killing was bloody. The most important place where sacrifices occurred was the Huey Teocalli, the Templo Mayor (Great Temple) of Tenochtitlan. Here a specialized priest with a sharp sharp knife removed the heart (by cutting below the chest) from the victim and the body was thrown down the steps of the pyramid, while his head was cut off and placed on the tzompantli, or skull rack. However, not all sacrifices took place on top of pyramids. In some cases mock-battles were organized between the victim and a priest, where the priest fought with real weapons and the victim, tied to a stone or a wooden frame, fought with wooden or feathered ones. Children sacrificed to Tlaloc were often carried to the god’s sanctuaries on top of the mountains that surround Tenochtitlan and the Basin of Mexico in order to be offered to the god. Those sacrificed to Xipe Totec were also skinned, most probably in imitation of seeds shedding their husks. 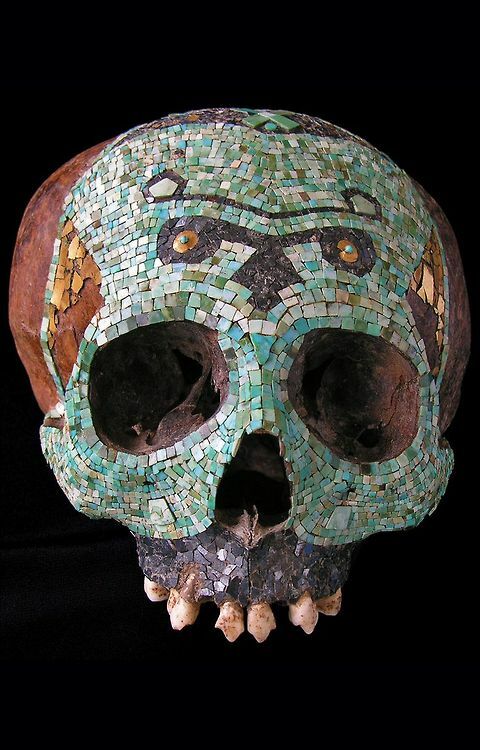 Estimates suggest 20,000 people a year were sacrificed by the Aztec royalty. After the sacrifice, the heads of victims could be displayed in racks (tzompantli), depictions of which survive in stone architectural decoration, notably at Tenochtitlán. The flesh of those sacrificed was also, on occasion, eaten by the priests conducting the sacrifice and by members of the ruling elite or warriors who had themselves captured the victims. This altar-like stone vessel was used to hold the hearts of sacrificial victims. Shortly before noon on October 21, 1805, a fleet of 27 Royal Navy warships sliced through the seas near the southern coast of Spain. Onboard the flagship HMS Victory, Lord Horatio Nelson paced the main deck, his gazed fixed on the 33 French and Spanish ships floating on the horizon. Traditionally, enemy fleets would face each other in parallel lines. Nelson’s strategy was to arrange his ships in two smaller squadrons at right angles to the enemy – one column lead by Nelson in HMS Victory, captained by Thomas Hardy; the other by Admiral Cuthbert Collingwood in HMS Royal Sovereign. That way, Nelson hoped to get in among the enemy and spread confusion from the outset. It left them vulnerable to enemy fire as they approached, but allowed them to rake the enemy – fire along the length of the ships, causing huge damage. Unable to return fire during their approach, Victory’s 820 crewmen could only grit their teeth and take cover as iron shot ripped through their decks and rigging. One blast hewed Nelson’s personal secretary clean in half. Another tore through a group of marines, killing eight men and mauling several more. Seemingly ignoring the mayhem, Nelson continued to stroll the deck alongside Victory’s captain, Thomas Hardy. “This is too warm work to last long,” he mused. As their twin columns inched toward the Combined Fleet, Nelson’s 18,000 sailors readied themselves for a fight. They ate a hearty breakfast, stowed wooden objects that might splinter during battle, and stuffed bandages and handkerchiefs into their ears to dull the roar of cannon fire. Similar scenes had already unfolded on the decks of the 33 Franco-Spanish vessels, which had formed a traditional battle line that stretched several miles. 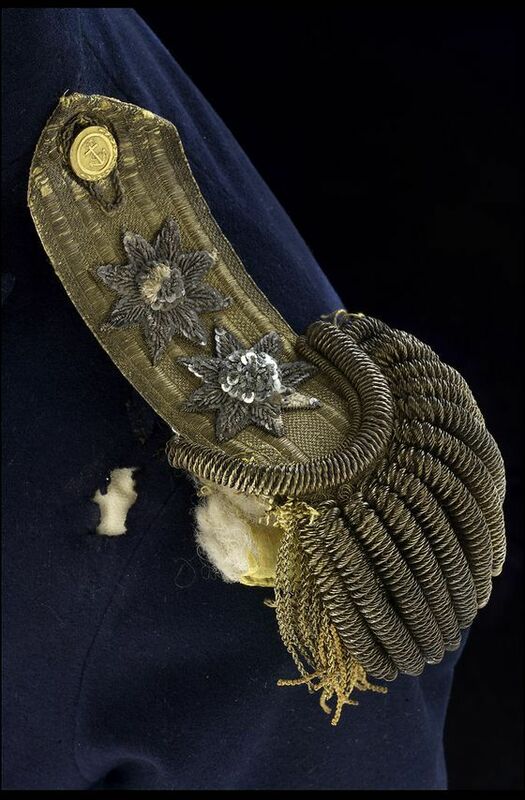 On the French flagship Bucentaure, Admiral Villeneuve displayed a bronze Imperial Eagle to his crewmen, who responded with patriotic cries of “Long live the Emperor!” At half past noon, Victory finally advanced within firing range of the Combined Fleet. The British vessel immediately steered toward the stern of Villeneuve’s Bucentaure and unleashed a blast from a carronade, a 68-pound gun packed with both a single cannonball and a hive of 500 musket rounds. They followed it with a withering broadside from their 50 portside guns. After only a few minutes, 20 of Villeneuve’s cannons were disabled and some 200 French crewmen lay dead. Having struck a ferocious blow against the enemy flagship, the badly damaged Victory continued its rampage by confronting the 74-gun French vessel Redoubtable. The two vessels soon rammed into one another and became entangled. As the ships shuddered from broadsides fired at point blank range, French marines tried to clear the British decks with musket fire and hand grenades. 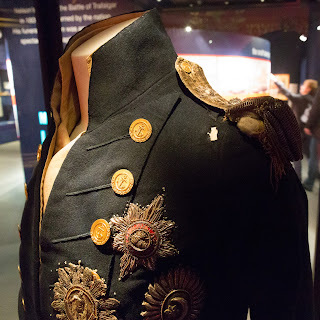 Around 1:15 p.m., a sniper on Redoubtable’s mizzen top took aim at Nelson and shot him in the shoulder. 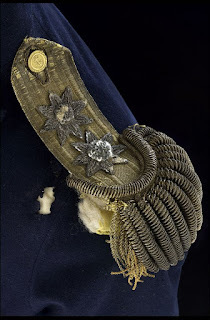 The musket ball passed through the Admiral’s back, severing an artery and smashing part of his spine. “They have done for me at last, Hardy,” Nelson cried as he collapsed in agony. He died later that day. Around 1:45 p.m., Villeneuve’s flagship Bucentaure became the first French vessel to strike its colors in surrender. Redoubtable followed suit a few minutes later, having been pummeled into submission by repeated broadsides from both Victory and the British HMS Temeraire. More French and Spanish ships gave up over the next few hours, and following an abortive assault by their long overdue vanguard, the remaining vessels of the Combined Fleet hoisted their sails and took flight. By then, 19 French and Spanish ships had been captured or destroyed and some 6,000 of their sailors were dead or wounded. 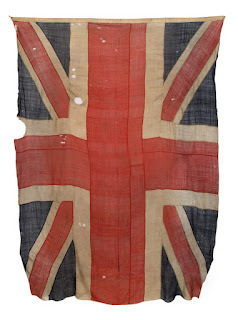 Despite suffering some 1,700 casualties of their own, the British hadn’t lost a single ship. 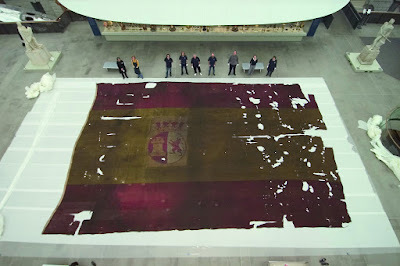 Top image: Flag of Spanish warship San Ildenfonso, which fought against the British fleet led by Nelson at the Battle of Trafalgar. 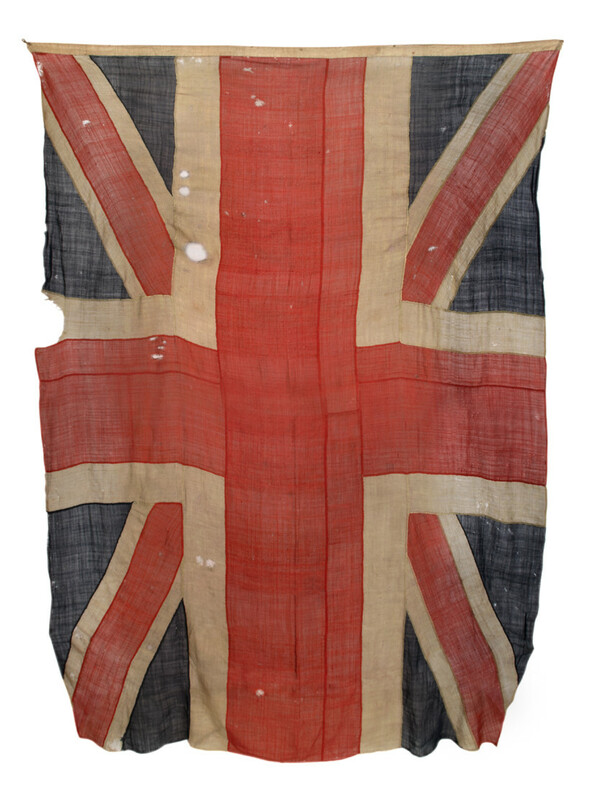 Later it was hung at Admiral Nelson's funeral at St. Paul’s Cathedral alongside a similar French flag. It was the arrival of the cannon in the 16th century that finally heralded the end of elephants being used as an instrument of war. Until that time, from as early as 1000BC, they trampled across battlefields around the globe, through wars in places as far flung as Yemen and Sri Lanka. The use of elephants in battle spread from India to Persia, and the first encounter between European forces and pachyderms took place in what is now Northern Iraq, with Alexander the Great winning a decisive victory against Darius III of Persia. Evidently, the fifteen elephants deployed by the Persian forces were not enough to secure victory – Alexander left the battlefield having conquered Babylon and most of Persia. The impact of the giant beasts of war did not go unnoticed by the legendary Macedonian king, who took them into his own army. The terror that the unfamiliar smell and sight of the elephants had on the cavalry proved to be a useful tool for Alexander in further battles, and he went on to control as many as 100 war elephants. 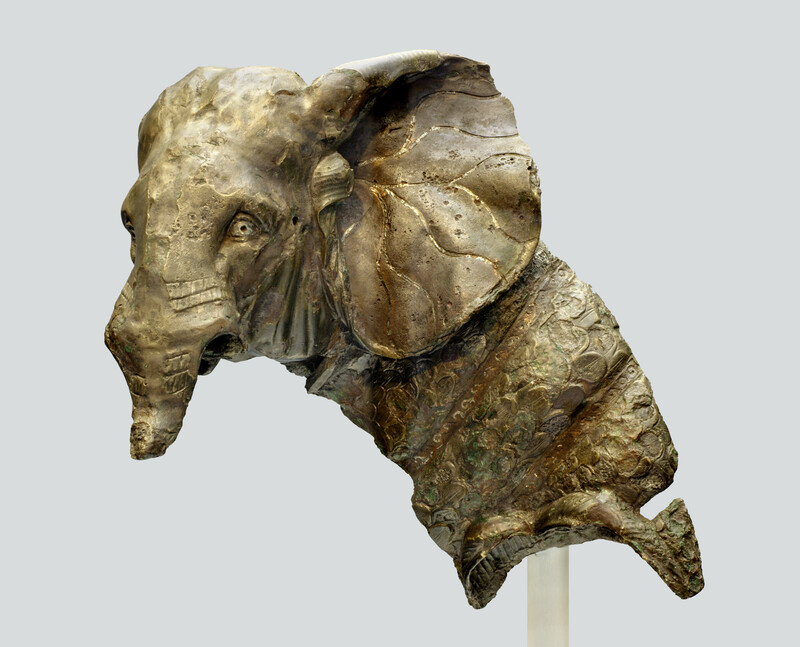 War elephants were introduced to the Mediterranean by King Pyrrhus of Epirus. He brought twenty to attack the Romans at the battle of Heraclea in 280BC and won decisively because the Roman’s were unprepared for the war elephants. 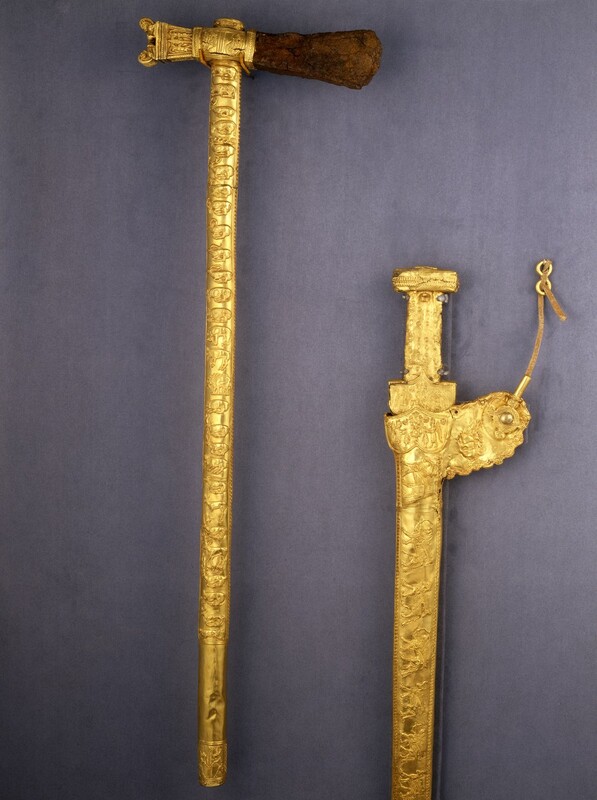 An elephant sword, these were attached to the tusks of war elephants. India 15-17th C.
Widely acknowledged as one of the greatest military leaders in history, the Carthaginian general Hannibal famously invaded Italy from the north in 218 B.C., crossing the Alps from Gaul with an army of foot-soldiers, cavalry and a handful of north African forest elephants, smaller than the Asian and African elephants familiar to today’s zoo-goers. Of the six elephants that survived the arduous mountain trek, five died the following winter. 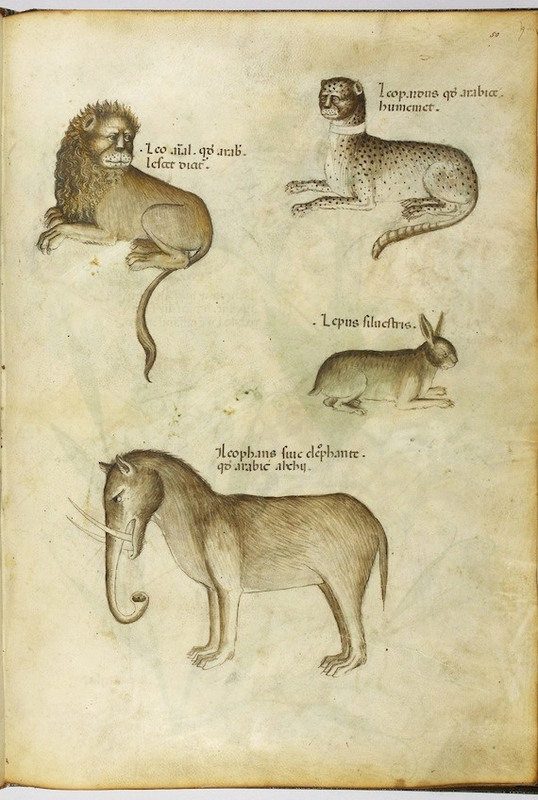 The sixth, a one-tusked elephant named Surus, became Hannibal’s mount and mobile viewing platform in the marshes of the Arno. Over the next 15 years, Hannibal won significant battles and occupied much of Italy, sometimes with reinforcement elephants shipped directly from Africa. In a 209 B.C. battle with the Roman consul Marcellus, Hannibal’s war elephants created havoc until the Romans managed to wound one, touching off a cascade of panic among the pachyderms. The Delhi Sultanate used war elephants against the Mongol hoards led by Timur Khan in 1398; however the Indian forces were defeated. It is unknown exactly how Timur managed to solve the problems caused by the 120 elephants he encountered; one legend states that he attached straw to his camels so that when the giants of the animal kingdom got close, he could set the straw on fire, causing the camels to run forward. From the sixteenth century, the use of gun powder in battle made it considerably easier to bring down the animals, diminishing their effectiveness and bringing an end to their use on the battlefield. However they continued to be used for transportation and logistics in warfare right up to the Second World War, where they were used by Indian and Burma forces to transport guns and supplies, and to assist in engineering projects such as road and bridge building in remote areas where vehicles could not be used. This fabulous 17th century armour is composed of 5,840 plates and weighs 118kg, some plates are missing and originally the total number would be 8,439 and weigh 159kg! 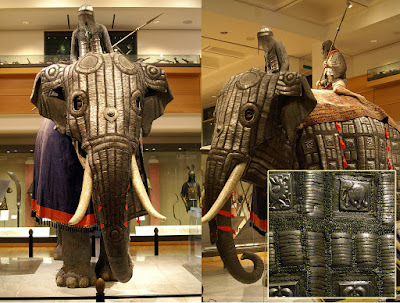 The tusk swords that accompany this armour (not on display) weigh in at 10kg. In 2009 during the construction of the Weymouth Relief Road in Dorset archaeologists from Oxford made one of the most exciting, and disturbing, archaeological discoveries in Britain in recent years. They have found a mass grave of 54 skeletons and 51 heads of men executed some time between AD 910 and 1030. Naked, beheaded, and tangled, the bodies of 51 young males have been identified as brutally slain Vikings. For more than 1,000 years this bloody roadside act was forgotten, one of many atrocities in the long and violent struggle between the Anglo-Saxons and the Norse invaders. On November 13, A.D. 1002, Æthelred Unræd, ruler of the English kingdom of Wessex, “ordered slain all the Danish men who were in England,” according to a royal charter. 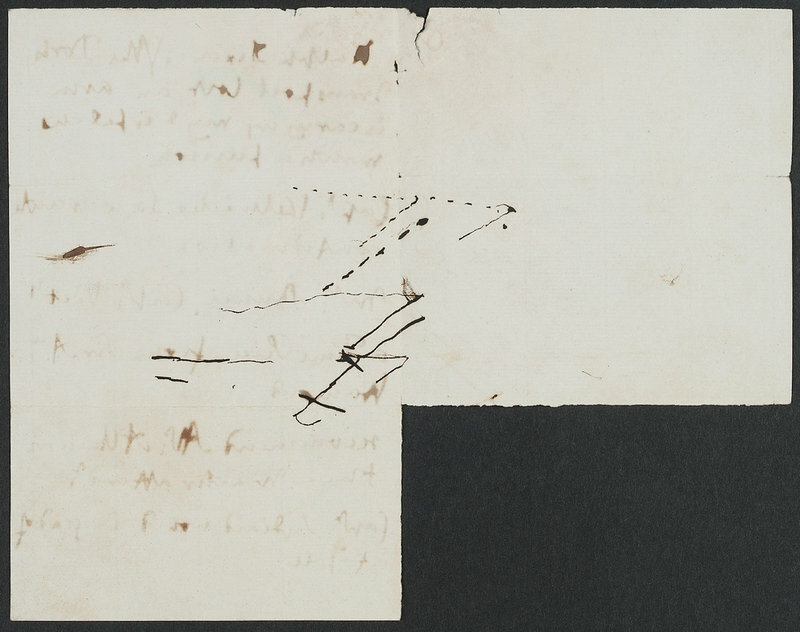 This drastic step was not taken on a whim, but was the product of 200 years of Anglo-Saxon frustration and fear. 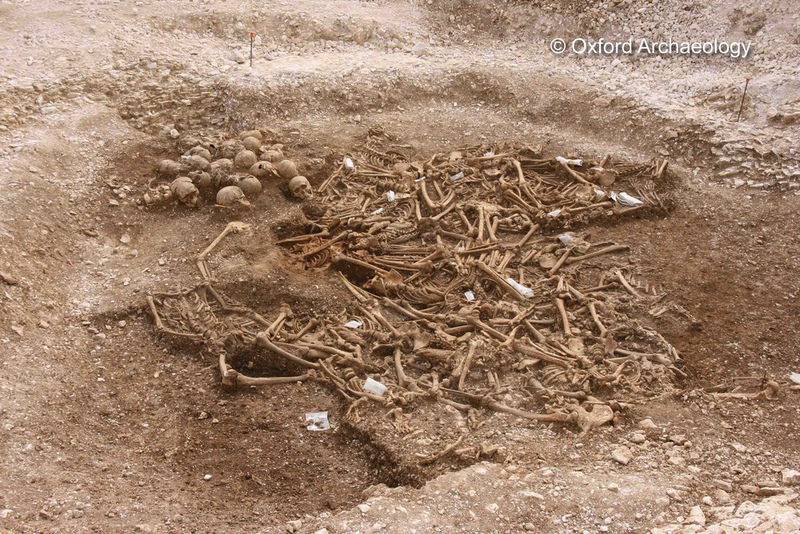 The 54 skeletons were all of males, almost all aged from their late teens to around 25 years old, with a handful of older individuals. 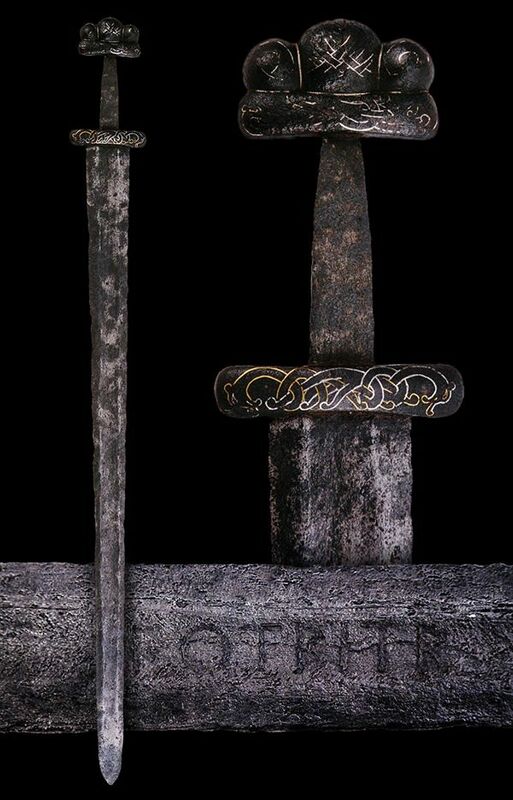 They had all been killed at the same time with a large, very sharp weapon such as a sword. They had not been cleanly killed, as many of them had suffered multiple blows to the vertebrae, jawbones and skulls. One man had his hands sliced through, suggesting that he had attempted to grab the sword as it was being swung towards him. They had no obvious battle wounds and were most likely captives. Judging from the lack of any remains of clothing or other possessions, they had probably been naked when they were thrown into the pit. There are more bodies than skulls, suggesting that a couple of the heads – perhaps of high-ranking individuals – were kept as souvenirs or put on stakes. 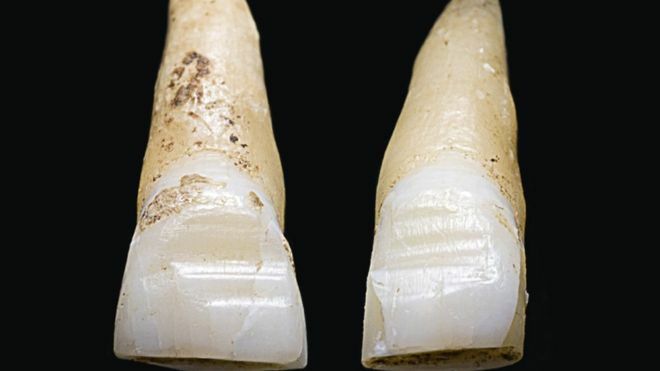 A chemical analysis of teeth from ten of the men showed they grew up in countries where the climate is far colder than Britain - with one individual thought to have come from within the Arctic Circle. Now we know that they were Viking mercenaries. We know that for their teeth, which some of them had grooves filed into his two front teeth. 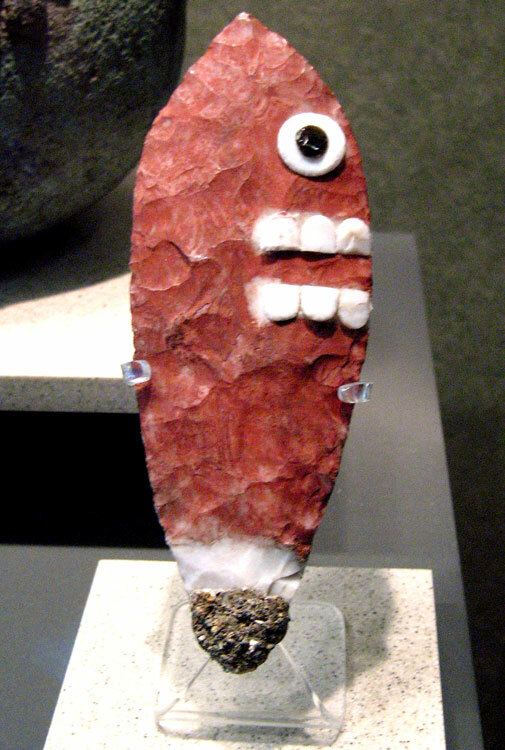 Archaeologists think it may have been designed to frighten opponents or show status as a great fighter. This is a typical for Jomsvikings, a group of warriors from eastern Denmark who were feared across Europe and became so notorious they spawned their own saga. The Jomsvikings were forbidden from showing fear, and if executed would request to face the blow as proof of their bravery. 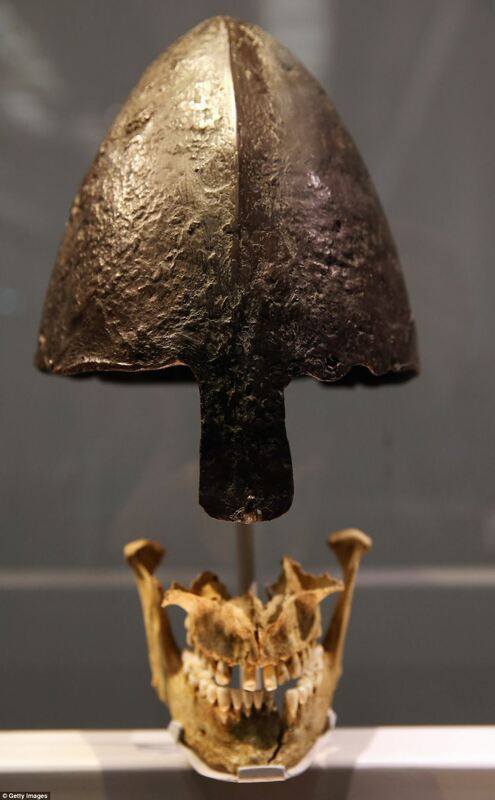 Few kilometers from the mass execution archaeologist have found helmet, axe and jawbone belonging to high rank Viking. There is a speculation that it's one of three missing heads from the Dorset execution. Maybe a leader of band whose head was taken as a trophy? Dating of the helmet gave us an answer that it's highly possible. 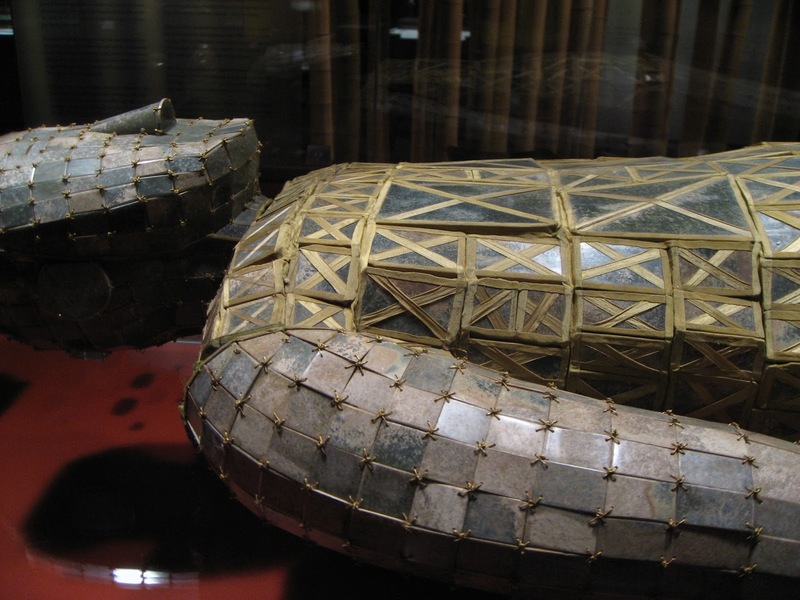 To be immortal - chinese jade burial suites, 2200 years old. Just 15 of the extraordinary head-to-toe jade suits that promised immortality to the Chinese imperial family have ever been found. During the reign of Chinese dynasties, the ancient Chinese believed that when a person dies, he or she entered into the after life. Death was comprehended as a prolongation of life, and an emperor's mausoleum was his after-life palace, mirroring his regal life on earth. All of the daily comforts of their past life such as servants, attendants, objects, pets, wives, guardians, concubines, food and drink were to be provided for them in the after life. This was accomplished by burying all of these things with the deceased when they died. As an ancient Chinese philosopher said, "Treat death as life." It was not uncommon to kill people in order to be buried with their master, but as dynasties evolved clay replicas replaced the real thing. 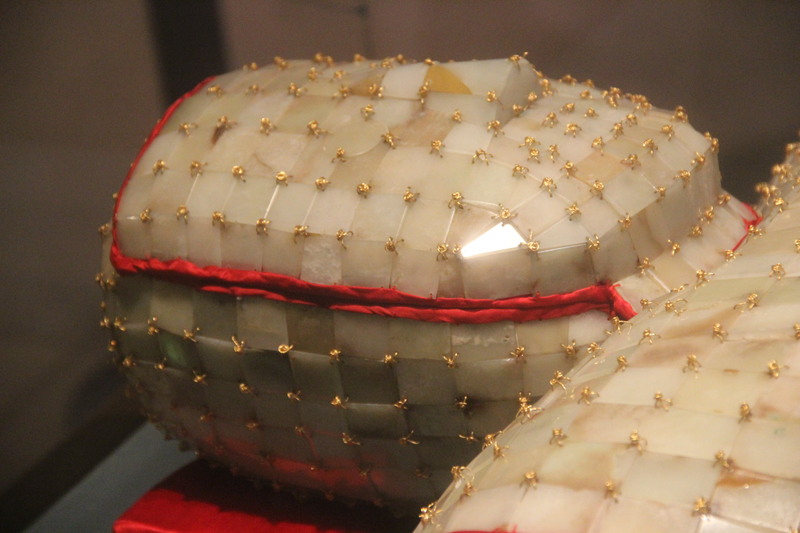 Corpses, such as that of emperor Liu Sheng and his wife the princess Dou Wan, have been found in spectacular jade suits made of thousands of small plaques sewn together with gold thread. The Chinese believed that jade would protect the corpses from decay; it was a symbol of life and vitality. Liu Sheng's tomb in Mancheng, Hebei was built like an actual house with horses, stables, windows, storerooms with cookbooks and even a bathroom! Most of the 2,800 goods found in this tomb are unique and include the jade suits and other jade products, the famous Changxin Palace lantern and a gold-inlaid furnace. 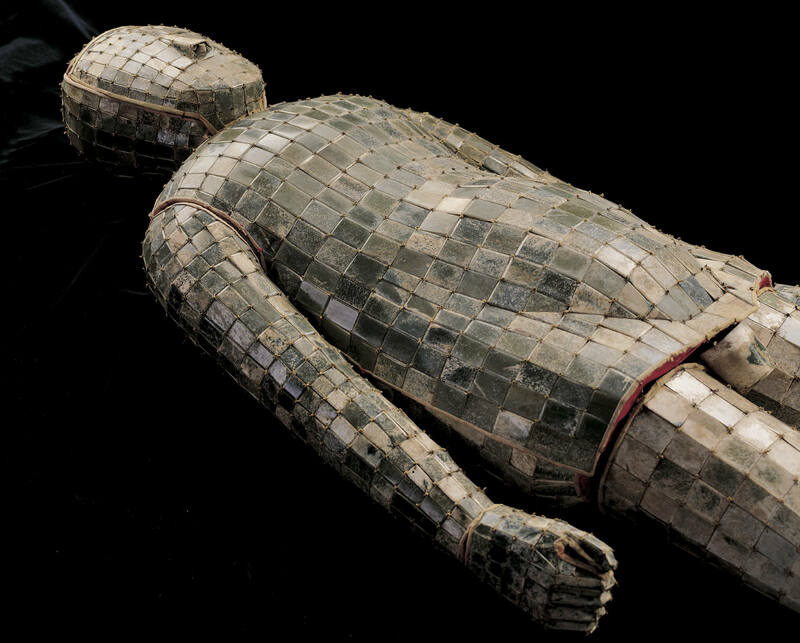 The making of a jade burial suit was no easy job, because it had strict requirements on techniques. First, jade materials transported from far-away places were processed into thousands of small jade pieces of certain shapes and sizes after lots of procedures; second, each jade piece was polished and drilled, with the shapes and sizes of the holes undergoing special scrutiny and delicate processing; third, a lot of specially made gold, silver or copper threads were used to join the jade pieces. 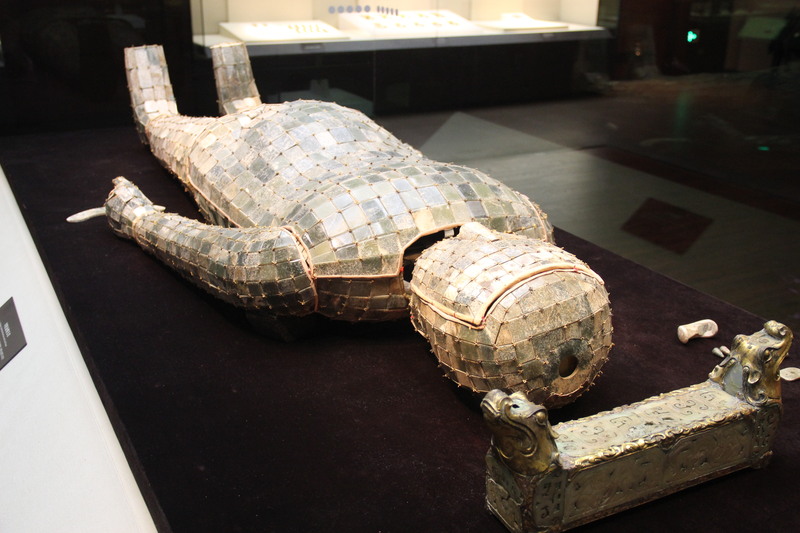 The finished suites were respectively called "gold thread sewn jade burial suit", "silver thread sewn jade burial suit" and "copper thread sewn jade burial suit". The shape of the suit was the same as a human body. The cost of making a medium-sized jade burial suit was almost equal to the property values of 100 then middle-class families put together. You can have an idea what an extravagance the suit was. The most representative jade suit is the gold thread sewn jade suit found in the tomb of Liu Sheng in Mancheng, Hebei Province. It consists of 2,498 jade plates of different sizes that are joined with gold threads of over 1,000 grams. It was completed by more than 100 craftsmen in over two years. Jade suits were first documented in literature around AD 320, although there is archaeological proof of their existence over half a millennium before. However, their existence wasn’t confirmed until 1968, when the tomb of Prince Liu Sheng and his wife Princess Dou Wan of the Han Dynasty was discovered. Believed to be one of the most important archaeological finds of the 20th century, the undisturbed tomb was unearthed in the Hebei Province behind a wall of iron between two brick walls and a corridor packed with stone. The land surrounding Siberia’s Ukok Plateau is vast. Harsh in the winter, the region of Altai Krai is home to the Altai Mountains and the Ob River and her estuaries. The plateau descends into the Pazyryk Valley, which contains ancient kurgans (burial mounds) in the style of the Scythian peoples who inhabited the area in over two thousand years ago. 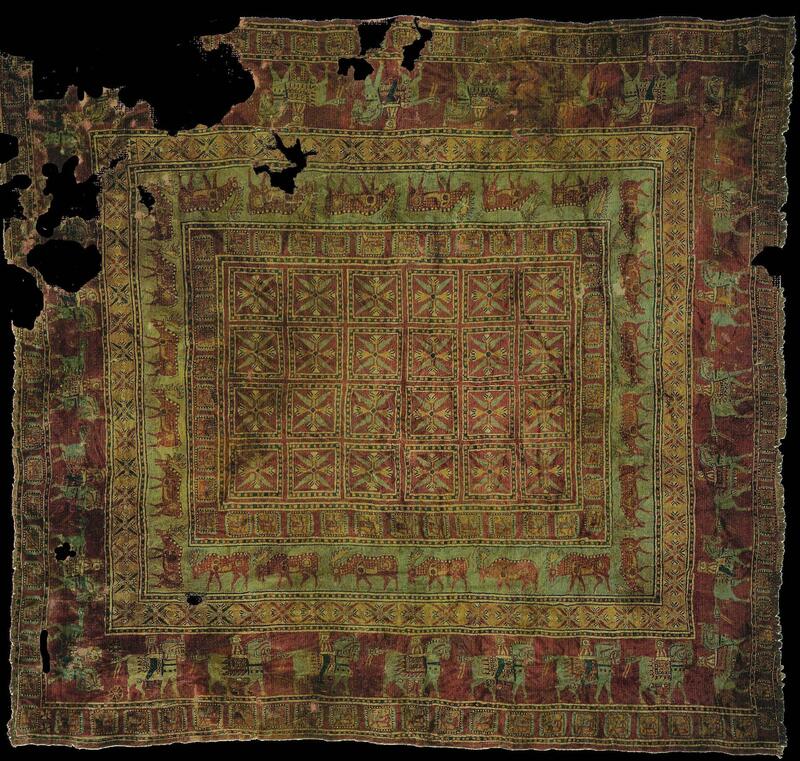 One of the most famous finds at Pazyryk is the Pazyryk carpet, which is probably the oldest surviving carpet in the world. It measures 183×200 cm and has a knot density of approximately 360 000 knots per square meter, which is a higher knot density than most modern carpets. adiocarbon testing revealed that the Pazyryk carpet was woven in the 5th century B.C., thus approximately 2500 years old. The advanced weaving techniques and the sophisticated design and construction, used in this rug, suggest the art of carpet weaving to go back much further than the 5th century B.C.. to be at least 4000 years old. 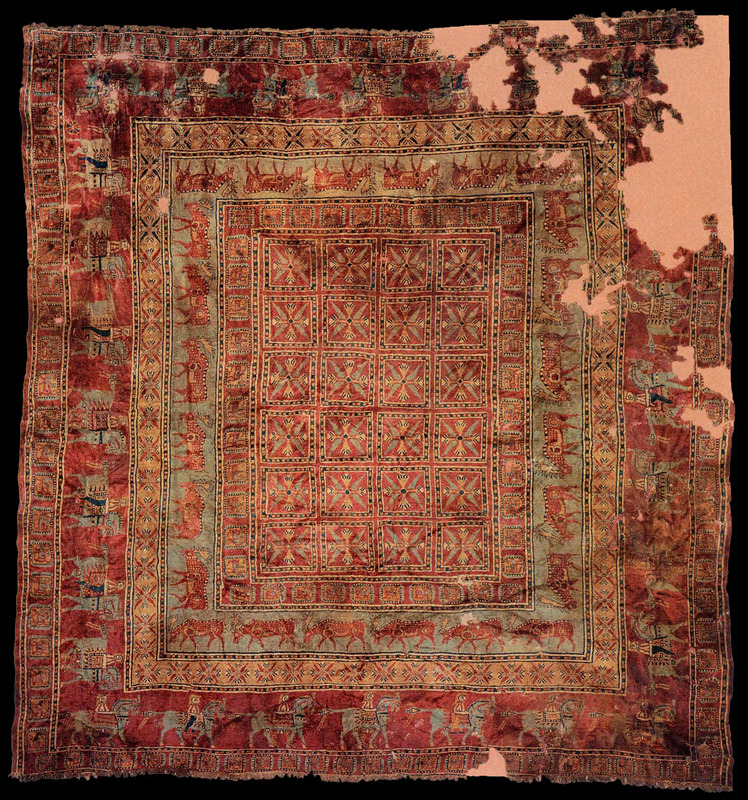 Although it was found in a Scjythian burial-mound, most experts attribute the Pazyryk rug to Persia. Its design is in the same style as the sculptures of Persepolis, The outer of the two principal border bands is decorated with a line of horsemen: seven on each side, twenty-eight in number -- a figure which corresponds to the number of males who carried the throne of Xerxes to Perspolis. Some are mounted, while others walk beside their horses. 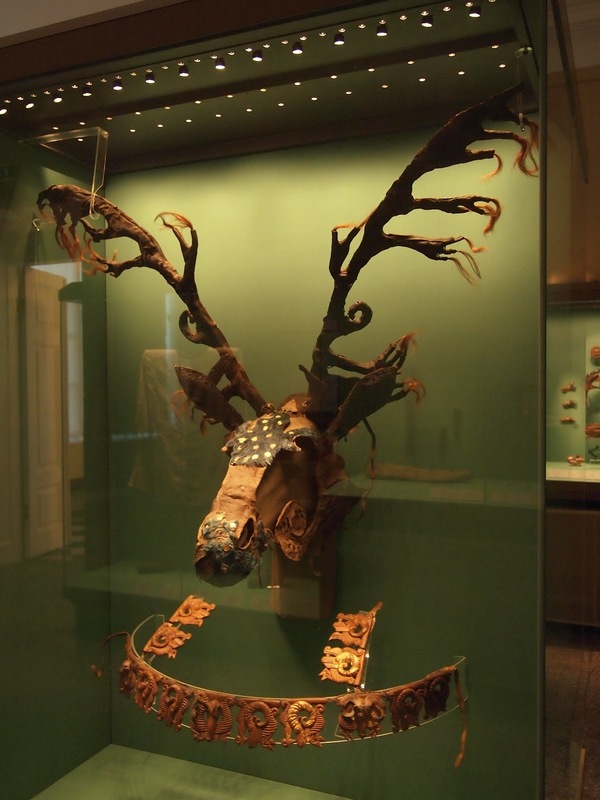 In the inner principal band there is a line of six elks on each side. he symbols within this magnificent carpet speak to the Scythians deep connection with the metaphysical, celestial, and animal kingdoms. The center motif is thought to have magical significance: pairs of rosettes or lotus blossoms surrounding a solar symbol are thought to represent their attunement with the sun.